One of the most common complain by small business is bankers do not give loan to small businesses. The reality is banks are in the business of making money mainly through risk management. They take deposit from one person and give it another person in a form of loan. They are expected to protect the depositors and the owners’ money. Therefore, bankers must put in place key conditions that will differentiate a potential defaulter from a good loan. If you plan to borrow money from banks or any other lender, it is important you understand these 6 conditions. Character is the beginning of everything in a business relationship. It talks about honesty, attitudes, willingness and commitment to pay back when you borrow. Bankers usually use your credit history and score to assess your character. They are looking for a reliable borrower who demonstrates responsibility and good credit history. This is similar to a background check most employers do on a potential employee. I prefer to call it “know your borrower”. They sometimes go further to search for any history of ethical issues or litigations. They will not lend to someone with a bad character. 1. Do you have the ability to repay the loan? They will use different measures of financial soundness including financial statement analysis (past and projection). This condition can disqualify many small businesses. 2. Capacity check also includes the track records of the business owner(s) and the senior management. Can you run this type of business? 3. It sometimes cover the legal capacity of the business to such type of agreement. They also check the financial condition in a form of equity in the business. The greater the firm’s net worth or owners capital, the lower the risk to the provider of the loan. In simple term how much money do you have at stake in this business? Imagine approaching a bank to borrow $200,000 on a business where your stake is only $2,000. 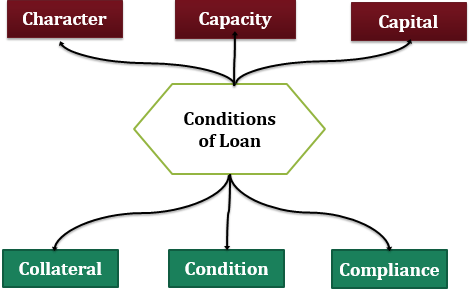 This reviews the extent to which the borrower will or can pledge assets to protect the provider of loan. Collateral includes property, lieu, government guarantee, insurance etc. In most cases, bankers prefer a collateral with value more than the loan amount of at least by 150%. What are the economic, technology, social or regulatory trends that can impact your business? What are the possible effects of these conditions on the business performance in the future? Interest rates, exchange rates, inflation, value chain, political issues etc. Many bank had cut their lending activities in 2008 due to the economic conditions. During this period, unemployment increases and consumer demand went low in most sectors. The legality of the credit agreement and, in particular, the adherence to the regulations and law pertaining to the credit situation is very important to bankers. This is a legal risk which can focus on areas such as ultra vires (beyond the power). The ultra vires problem arises where the borrower has not got the legal right to enter into a particular type of transaction. Compliance can also include the regulatory requirement such as filing and paying tax, filling annual accounts, environment and safety issues etc. Bankers usually attached score to each of these conditions in order obtain a credit score. It is the credit score that heavily influence the decision of most lenders. Above all, it is important for small business manager to understand these conditions because even Small Business Administration loan application typically required you to fulfill some of these conditions. Be the first to comment on "How Bankers Assess your Loan Applications"